by Gilbert R. Rendle. Rowman & Littlefield, 1999. Congregational consultant and author Gil Rendle provides practical tools for congregations to manage their differences with maturity and respect. These tools are developed in response to Rendle’s observation of widespread ‘uncivil’ behavior in a diversity of congregations. Rendle argues for congregations to adopt ground rules for behavior in times of disagreement, which he calls “holy manners for a faith community”. This brief, easy-to-read text gives background on the issue of congregational disagreement and the problem of uncivil behavior. 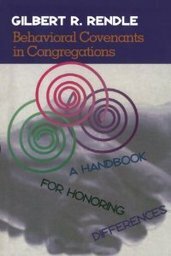 Rendle argues for the implementation of behavioral covenants and provides several outlines for congregational retreats or meetings to discuss norms and plan behavioral covenants. The appendices include an article on ‘spiritual politeness’ in healthy congregations, examples of unhealthy congregational norms, sample covenants for governing boards, staff, and troubled congregations, as well as planning documents for preparing a covenant. Many different types of congregational groups of all traditions - especially boards - will find this book invaluable.